What’s better than enjoying a cabin retreat with friends? Enjoying a cabin retreat with friends that you guys built together. Couple Jeff Waldman and Molly Fiffer wanted a place where they could hang out and spend time with friends in nature. So, they decided to build one… with no construction or design experience whatsoever. 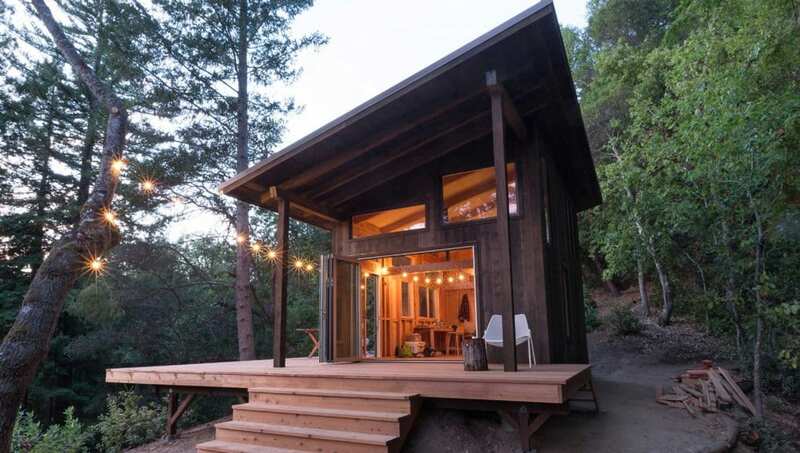 It took them two years to create their outdoor cabin deep in a 10-acre forest in California’s Santa Cruz Mountains. The off-the-grid structure is simple and made from reclaimed wood. It features a series of elevated tree deck and some pretty sweet amenities. It boasts a wood-fired hot tub, open-air outdoor shower, and an outhouse to get your business done. And the views from this place are absolutely incredible. The couple’s main goal was a place where they could connect with nature and get away from their busy modern lives. Once they found a spot in the woods, they went to look for salvaged building materials like windows and doors. Waldman and Fiffer did most of the building themselves with some help from friends. Their retreat looks like a completely professional building. You would never know they were inexperienced builders. Honestly, it’s quite the work of art. It’s more of a retreat complex. The complex is comprised of a wooden cabin and elevated decks that are suspended from the trees. The wooden cabin has a sloped roof and set off of the ground to reduce the impact on the landscape. It features a large open living space, as well as a sleeping loft. It’s also filled with large gorgeous windows that fill the space with natural light. The wrap-around wooden deck is great for entertaining. It features a long wooden table where friends can gather around. The wood used to build the cabin is local redwood that came from a nearby mill. Some of the construction beams came from Habitat for Humanity’s Restore. The outdoor shower is quite luxurious looking and sits about 10-feet-off the ground. It’s heated by an off-grid heater and is illuminated by solar-powered lights. The outhouse is a cubed building with a compost toilet and reclaimed sink located behind the cabin. It also has a solar-powered fan and lights. The tree decks go as high as 15 to 20-feet in the air, as to not disturb the landscape and are accessed by a 20-foot-long bridge. There’s also a space referred to as “The Dojo” which serves as an open-air kitchen that has a propane stove and solar-powered lights. It’s covered with a grey polycarbonate roof. The couple says they hope to build a guest hut and treehouse in their complex next.